Dabbling with designer makeup brands has become quite an eye-opening experience. I think there are 3 classes of makeup: drugstore, high end and designer. By designer I mean, $85 for a Christian Dior lipstick, because that’s a category all its own. When I first started trying and investigating Marc Jacobs Beauty, I was placing it in the high-end category, because his products seemed comparable in price point. However, if you really do some digging, you might want to bump it up to the designer category. 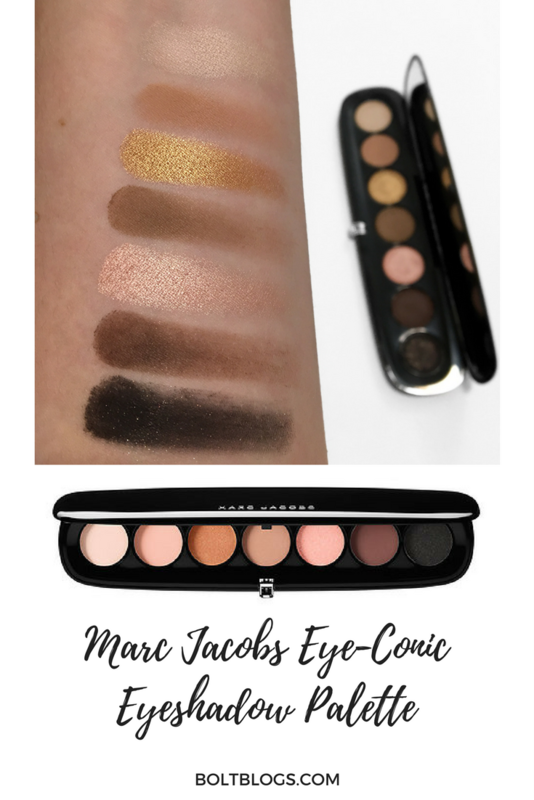 Let’s chat the Marc Jacobs Eye-Conic Eyeshadow Palette in Glambition. This palette comes with 7 gorgeous shades and includes 3 mattes, 3 shimmers and 1 glitter. You’re getting 1/3 the amount of product for pretty much the same price. So, is it worth it? Quality: The swatches on the left are one swipe without primer. On the right I blended them out with an eyeshadow brush after a few minutes. You can see that they really don’t want to budge and have great staying power. The only two shades that I was slightly disappointed with are Over the Top and Glamour. Over the Top swatches a little streaky and doesn’t blend quite as easily as the other colors, but it’s still very workable. 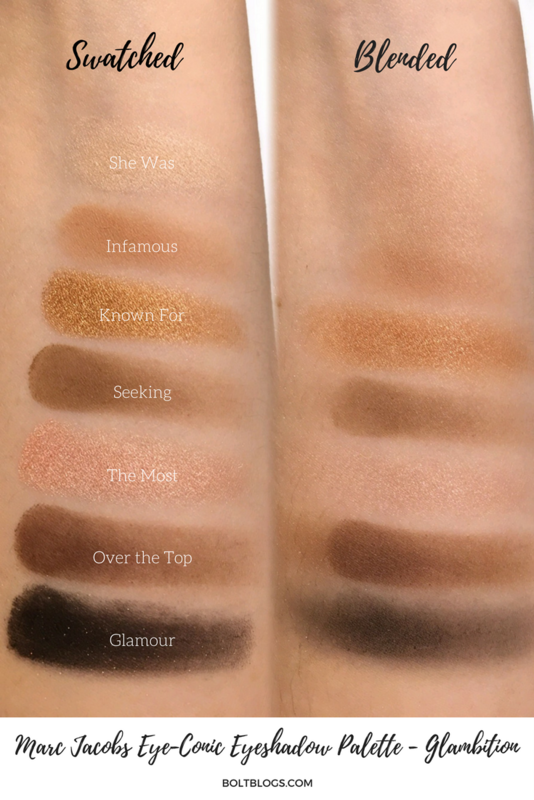 Glamour swatches beautifully but loses some of the pigmentation as you blend it out. This isn’t to say these colors are bad, they simply aren’t as impressive as the others. Verdict: If you are an eyeshadow enthusiast, I think this palette is worth the money. I’ve pretty much worn this palette exclusively since I received it to test out from Influenster. I also appreciate how nice the packaging is, especially considering the price point. I do not think this palette is a good pick for you if you go through makeup quickly because you’re getting1/3 the amount of product you might get with another brand. I also don’t think this is a good pick for you if you just want a good basics palette. If you want something that gets the job done without breaking the bank, my two favorites are this Neutrogena quad or this matte e.l.f. palette. I hope this was helpful if you’ve been curious about the launch of the new Eye-Conic palettes. There are 6 total palettes so if you’re interested, there’s probably a color palette for you!